Happy New Year everyone!!!!! I hope this Year will bring lots of happiness to your Families. 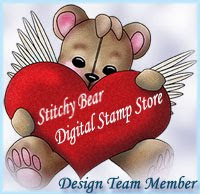 It's Wednesday, and it's time to Showcase some gorgeous product from Heartfelt Creations. This was my first Papers i work with to get to this amazing DT "Delicate Asters Collections". On the end of my post i have all links to the products if you wish to buy some. White Cardstock, Ribbon, double sided sticky Tape, Gems, Purple ink, Glossy Accents, MS punch, VersaFine onyx Black ink, Spica pen clear "Twinkling like a Star", hot Glue gun. Base of the card is 5" 1/2 x 7" 1/4. First i punched out one side of the card with MS punch, then i line up base card with Delicate Asters Collection Paper . Also i added beautiful Paper on the inside of my card. After that i stamped sentiment on the left top corner "My Wish For You" and traced with Spica Pen. With the help of very strong double sided sticky tape i added ribbon to the card by wiggle it from side to side. After i stamped and die cut Flowers i inked the ages and added Glossy accents to every petal. Then i used hot Glue to put flowers together and added Gem to the center. Also i used Heart shape Die from new Timeless Amour Collections with a touch of Gem, also i added Gems to the corner, and my card is ready. This is simply gorgeous! Love the ribbon and the way you used it here! Oh WOW!!!! How very pretty!!! I think it is gorgeous!!! Gorgeous flower and card!! Framing the flower on the DP with the heart die is brilliant! So gorgeous. That ribbon goes perfect with your flower. Nat, this is a gorgeous card. I love your colors and all the details. The flower is remarkable.